A youthful, fresh elderberry Brandy from the heartland of Austria. Alois Gölles Jr. grew up in his father’s orchards in Styria, Austria. As a child he earned extra pocket money by harvesting apples and currents alongside the farmworkers. Years later in 1979 he returned to the orchards, but this time to transform the family business from a wholesale seller of Alpine fruits to a boutique producer of Austrian spirits and vinegars. They currently produce a wide range of Eau de Vies and specialty vinegars. Some of the best and most innovative work in un-aged Brandies is coming out of Austria. 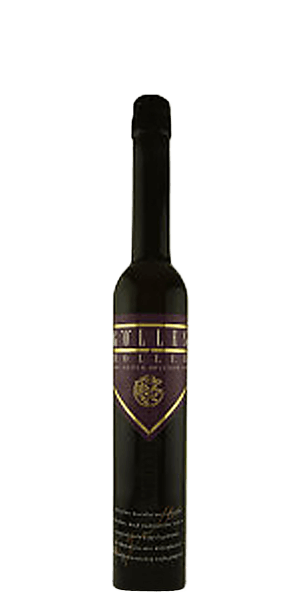 Gölles Elderberry Brandy is just what the name implies — a fresh, un-aged Austrian fruit Brandy made from the fruit of locally-grown elderberries. Great care is taken to ensure that the elderberries ripen on the plants before harvest. They are then carefully steeped at low temperatures and pressed to preserve the natural sugars and oils. The resulting juice is fermented and twice distilled into the famous “low Wine” that remains in such demand. What does Gölles Elderberry Brandy taste like? The Flavor Spiral™ shows the most common flavors that you'll taste in Gölles Elderberry Brandy and gives you a chance to have a taste of it before actually tasting it. It is a very good, intense, un-aged fruit Brandy with a long & tart death. I couldn't suppress a chuckle thinking of Monte Python and then I tasted it and the laughter stopped but, the smile lingered. Delicious and balanced. I would love to experiment with this more.